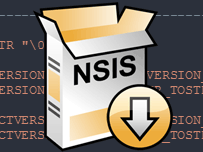 Tutorial to easily manage NSIS versionning from the source code without extra plugins or scripts. This tutorial will show you how to easily manage versioning in one place in the source. Create a file with the versioning inside. This file will be use to generate the versioning of the executable, but also to build the installer. #define PRODUCT_NAME        "ProjectName for users"
#define PRODUCT_TRADEMARKS  "All Rights Reserved"
#define TR_COPYRIGHT "Copyright © "
; Get information from "the file of versioning". ; Take care of the spaces inside the string to mach exactly the one inside the file of versioning. Inside the RC file, you can add a section like this.